January 26, 1978 – 10 a.m. I turned on the TV and watched the weather prediction. They told us to brace ourselves for a terrible storm that was coming with high winds. We usually only get 10-15 inches of snow all winter, so this was very unusual. I have never seen a blizzard. It’s about 50 degrees Fahrenheit right now. The wind began to pick up, the snow began to fall, and the temperature plunged. The phone rang and I answered it. My nursing supervisor, Marie said, “Pam, pack a bag to prepare to stay overnight at the hospital. The National Guard will be at your house in 30 minutes to bring you in for the evening shift tonight.” I quickly packed a couple extra uniforms, toiletries, and my Bible, and watched out my front window. When I saw a 4 wheel drive Jeep pull up, I put on my warmest hooded coat and ventured out. I had to lean into the wind,because it was so difficult to walk. I climbed in the back seat and said hello to the driver and three other nurses he had already picked up. We drove slowly through the deepening snow on the deserted streets and arrived safely at the hospital five miles away. I took report from day shift and began my evening rounds. My head nurse, Mrs. H. and I were the only staff that made it in for evening shift. Thankfully, they had cancelled all routine surgeries, but all our 30 beds were occupied. There was a friendly air of comradeship with all the patients that night. Those who were there for their week of diabetes classes helped us pass dinner trays to the patients who were bedbound. I went down to the cafeteria for dinner, and the hospital administrator was serving our food on the tray line. He smiled and thanked me for working through the blizzard! No charge for dinner tonight! The Guard brought in the night shift nurse and aide, so I was able to sign off at 11:30. Marie told us there were some empty patient rooms on the 9th floor, and to pick whichever one I wanted. I grabbed my bag, found an empty room, and closed the door. I turned on the TV and watched the blizzard. There were unbelievable pictures coming in of 15 foot snowdrifts from the high winds of 69 miles per hour. The roads were impassable and the temperature had dropped to -30 degrees. I could hear the howling wind as I looked through the window and watched the snow blow sideways in the dim street light. It was nearly a whiteout! I put on my pajamas and climbed into bed. I had never been a patient in a hospital, so this was a very strange experience. I was too keyed up to sleep. Then I heard a patient in the next room start to scream. I lay awake and prayed. The alarm went off at 6 a.m. I guess I dozed off at some point. I got dressed, read my Bible, and committed the day to the Lord. I went out to the nurses’ station and asked my nurse friends about the patient next to me. They said he was an alcoholic going through withdrawal, and they had to put his arms and legs in leather restraints while they medicated him. He nearly destroyed the room. I went down to the cafeteria and ate my free breakfast and then went back to the fifth floor. I was totally exhausted from little sleep and asked the Lord to give me strength for the day and to bring in the evening shift. Mrs. H and I were the only staff again so we split the floor in half. After we passed the medications and trays, we began the bed baths. We were running out of linens so we only changed the patient’s gown and sheets if they looked soiled. I was so happy when the evening shift arrived courtesy of the National Guard! I gave report, and then found a coworker who lived near me and volunteered to give me a ride home. I could barely get in my front door from the drifts. My roommate, Jane, had shoveled out as much as she could. We looked at our cars that were buried in the parking lot and decided to wait until the next day to shovel them out since we were both off of work. 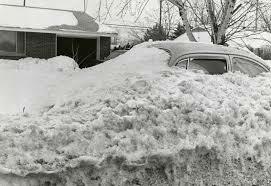 My car was buried after the Blizzard of 1978! I fell into bed after a quick supper, thanked the Lord for carrying me safely through the blizzard, and fell into a deep sleep. I have never needed the National Guard to bring me to work since then! Sadly, 51 people died in my state in the blizzard of 1978; 22 died when they left their trapped car and froze to death while trying to get to cover. But I still remember the comradery of the staff and patients as we all helped each other through that terrible storm. Now that I live in New England, I have been through several more blizzards. Later in the blog, I will share some of my harrowing tales of reaching my patients in the community as a visiting nurse. Previous postState Nursing Boards- Zzzzz…..